On Saturday night, my friend “Double Down” and his girlfriend, Marisela, had a housewarming party to celebrate the purchase of their new condo. They provided us with some great food and drink with a lot of Mexican flair even though it was President’s Day weekend. We ate marinated pulled pork soft tacos, chips with fresh homemade salsa, and arugula salad with goat cheese and bacon. For dessert we had fresh baked cookies and homemade ice cream sandwiches (flavors: salted caramel, peppermint, and coffee with donuts!) from the incredible Beakers and Cream (Double Down knows the owner personally, so that’s pretty awesome). While the food was wonderful, we also had some incredible beverages. Double Down mixed up a batch of Sangrita (orange juice infused with jalapeno pieces) to accompany some Tequila shots, which made it a star that night. Another one of my friends, AmasianV, started mixing drinks with whatever was at the bar. 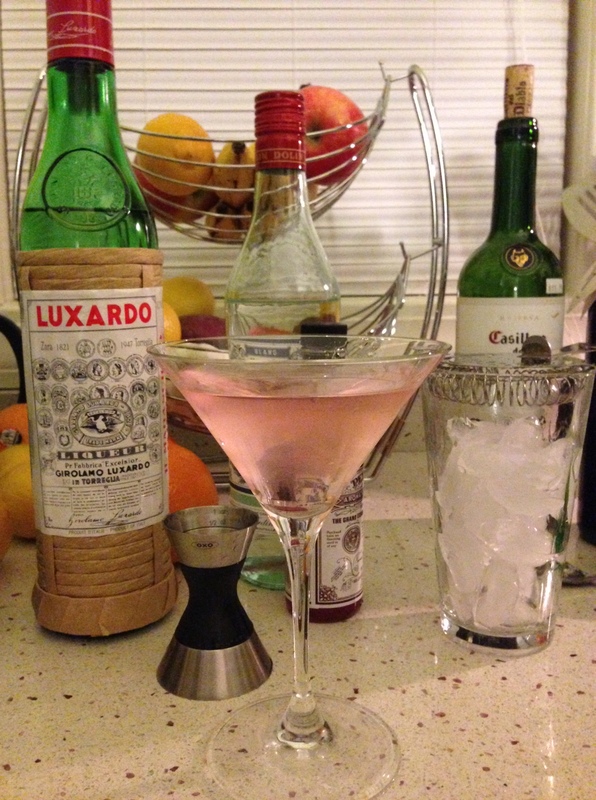 He came up with a drink that he aptly named the “Pink Martinez.” It’s a gin martini with a bunch of ingredients I had never heard of nor had I ever had before (other than the Hendricks gin that is). Turns out the drink is really light and tasty. 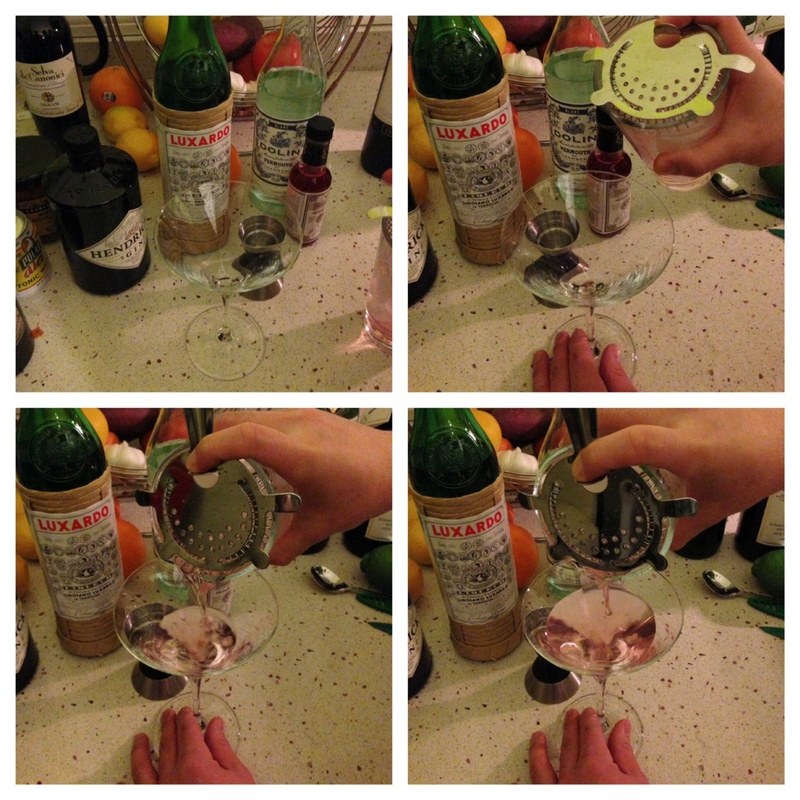 The overall effect is somewhat herb-y due to the gin, but it also had a little bit of a cherry, tea, and/or elderflower finish that reminded our co-host Marisela of… “something.” She couldn’t quite pin point what it was all night though. I really enjoyed the drink and I asked AmasianV if he’d let me photograph him making it, so I could share it on my blog. The results of that little endeavor are below! Makes one drink at 223 calories. Add in the 2 oz. 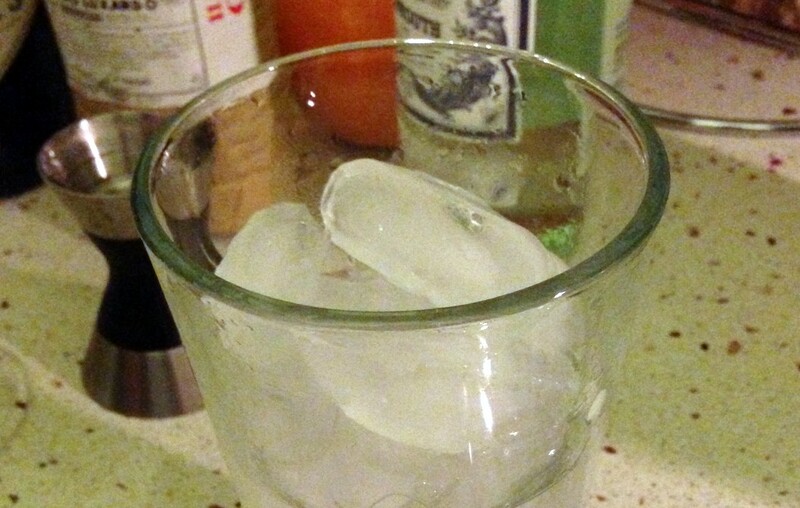 of Hendricks Gin to the pint glass. 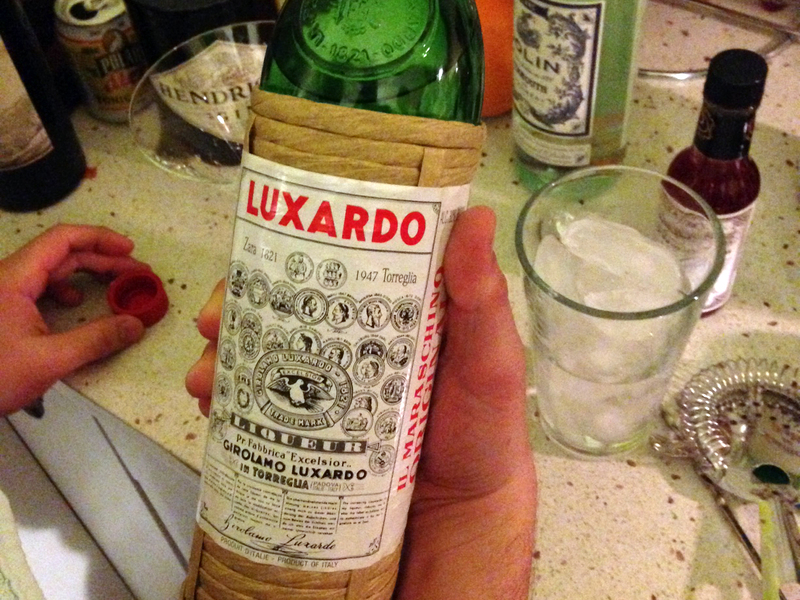 Note: This is different than common sweet vermouth, which is often a darker red color. Next, add the 0.5 oz. Luxardo. 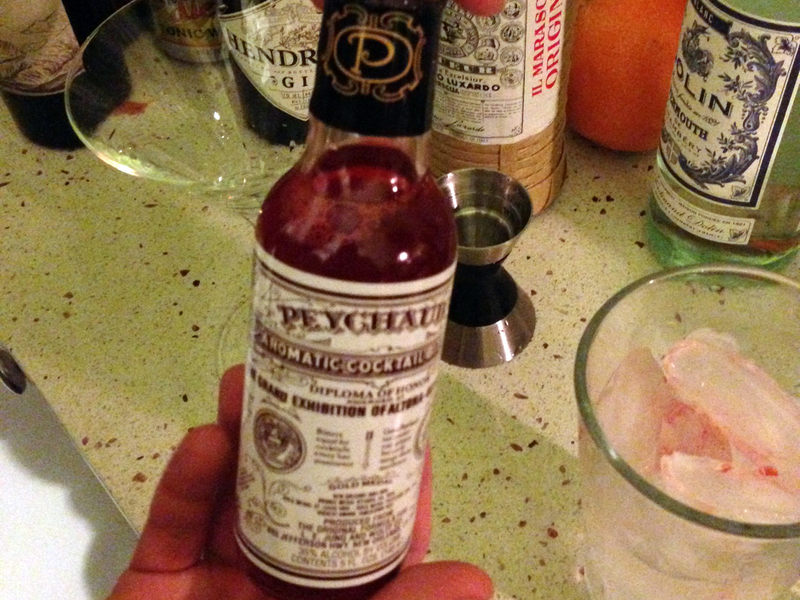 Lastly, add one or two dashes of Peychaud bitters. Note: It wasn’t prepared for me this way, but I think you could also add the dashes of bitters at the end after mixing the drink for a slightly different blend of flavors. Stir (do not shake) the ingredients for 30 seconds. 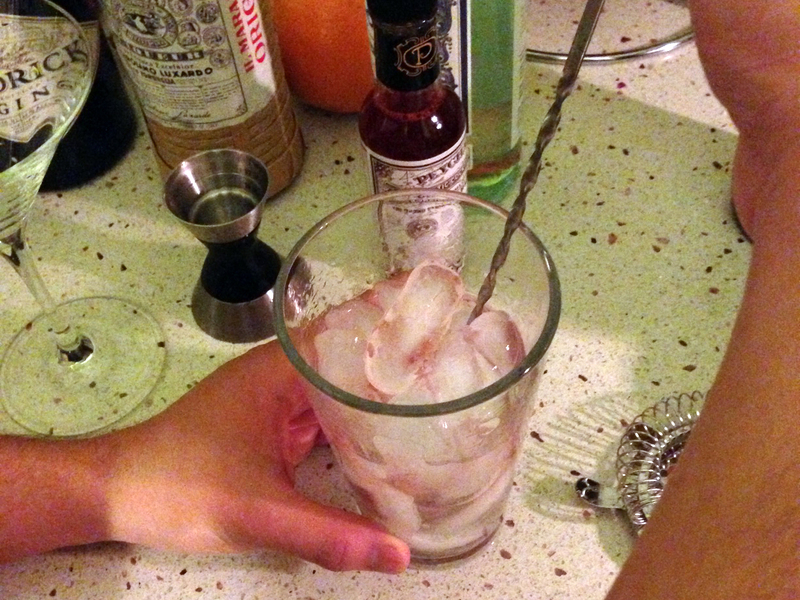 After stirring, put the cocktail strainer on top of the glass and pour just the liquid into a Martini glass. Garnish with something earthy or sweet and serve immediately. I think a cherry would go great with this drink, but you could also go with something a little more herb-based. Ooooo this looks so pretty and elegant! Let me know if you like it. I need an unbiased review. I’m totally unbiased! You also made a completely horrifying drink that night that no one could ingest and which I did not choose to blog about! Looks good, I could use a drink about now. Are you referring to my cornichontini? Oooh! Did someone mention gin?? This is my drink. Yum. Sounds like a grand ol’ time. I have those ingredients lying around — I’ll have to give that one a whirl! Would love to hear your thoughts on the drink. 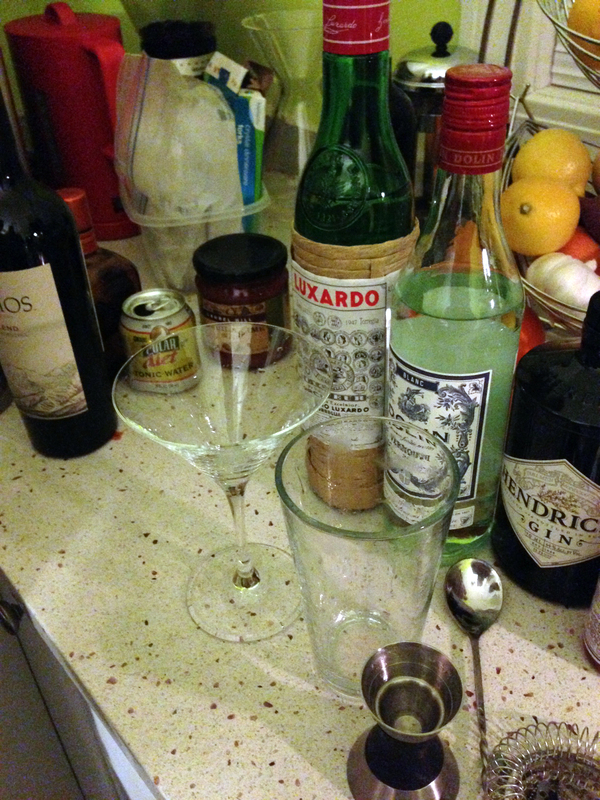 My friend just sort of whipped it up and has since critiqued himself regarding the brand of gin and lack of garnish. I personally, thought it all worked really well though. I’d also love to get your opinion on garnish recommendations. I am my own toughest critic. As for a garnish, lemon? Great pics. I love gin, so this is right up my alley. Thanks! The camera on the iphone 5 is really the only thing that warranted the upgrade, but I’m glad the off the cuff pics are turning out alright. I like the herb idea to finish it. What do you think would work best? Hendricks cocktails can always be finished with a cucumber slice, which melds with the intense cucumber flavor of the gin. yeah, I think the host was making Hendricks & cucumber tonics that night. Nice drink…will try this. 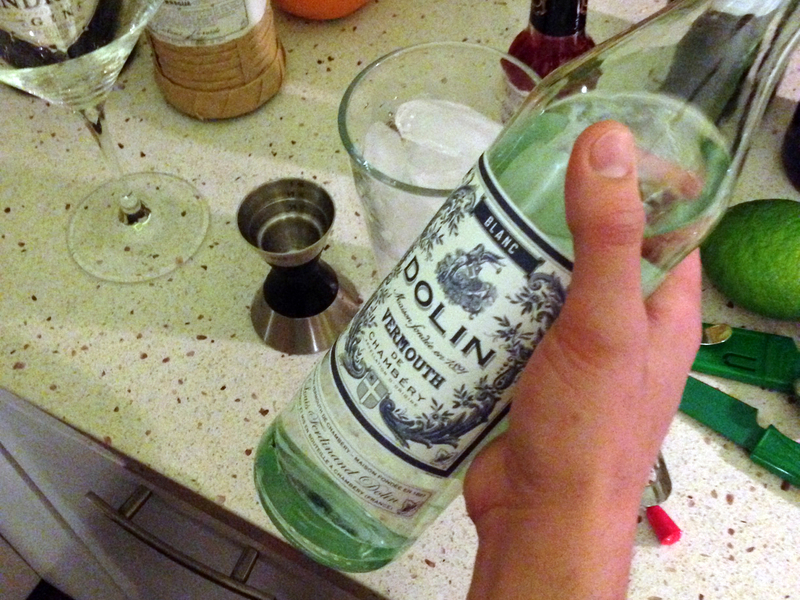 The Dolin vermouth is very nice stuff….